Just before 10 a.m., we began arriving at the designated meeting spot: a small circular parking area on East Shore Road. Peter Dolan, one of NYNJTC’s program coordinators (and the group leader) was already there with the gear, the signup sheets and the donuts. The crew members (there were 11 of us total) signed in and introduced themselves as they arrived. So we were all standing around talking about other hikes and travels we had been on: Ireland, Alaska, the Appalachian Trail (one of our number was a thru-hiker). A bear had wandered out of the woods and was now standing at the edge of the lot. It wasn’t a big one – I’d say it was about the size of a large dog. Didn’t get a photo because, being well-trained hikers, we were all too busy clapping our hands, yelling and generally making a ruckus. After a moment or two, the bruin turned and went running away through the woods. 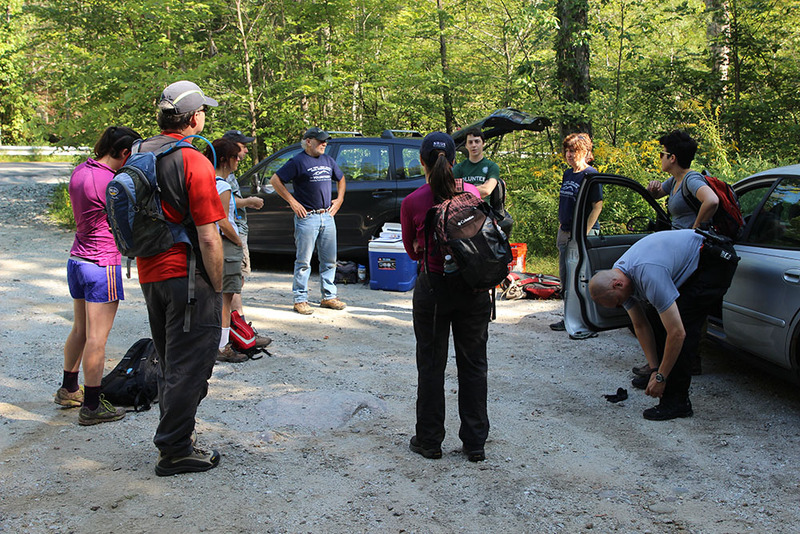 First order of business before heading out to the woods: we got a look at the gear. There were long-handled lopers and short pruning shears. There were branch saws – standard-sized ones as well as a significantly larger creature known as “Big Boy.” Also on hand were big buckets of work gloves and shatter-proof plastic glasses (to be used when chipping stone or doing any intensive sawing). One gizmo that we ended up not using (kind of a shame, really) was the weed whip, also known as the “swizzle stick;” a bizarre device that looks like the mutant offspring of a golf club and a machete. How it works: you strike at weeds and undergrowth with the blade end. Peter gave us the mandatory safety briefings, we were advised about the on-site restroom facilities (pick a tree and duck behind it) and we set off. We hiked back down East Shore Road toward the Jennings Hollow trailhead, which is marked by a yellow gate and a “fire road” sign at a footbridge crossing the brook. Squeezed through the gate – a few hardy souls climbed over – and we set off into the woods. We also spotted quite a few tire tracks which we believe to be from ATVs. And would any woodlands hike be complete without poison ivy? There was a positively luxuriant crop of Toxicodendron radicans in the undergrowth, so we had to watch where we stepped. Eventually we pruned and weed-whacked the trail into some state of navigability, so we moved along, stopping here and there to prune an overgrown branch or to kick some debris off the trail. If you’re pruning a branch, don’t cut it right in the middle of the branch, because that’ll do bad things for the branch when the tree sends nutrients out to it later on. Instead, make the cut right at a joint. Keep an eye out for “stobs” (at least I think that’s how they’re spelled): dead stumps of branch that are left on the tree after the rest of the branch was cut off. If you’ve got a springy tree that’s bent over and could fly back up like a catapult, cut away just enough to take some of the strain off the tree. For situations like that, always wear safety glasses. Always. It is also advisable, when doing some saw work, to have someone standing nearby to alert you if a tree or limb or other arboreal hazard may come crashing down – this person is known as the swamper. To report, or not to report? Not every dead or broken tree needs to be reported. But if it looks like it is leaning toward the trail, and looks as if it could very well come down on any hikers passing through, then it gets reported. Ditto for hanging branches. 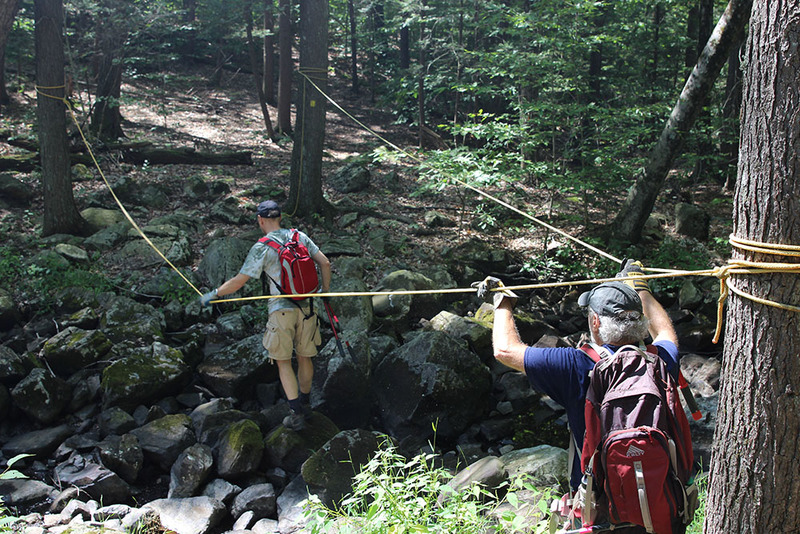 One of the two “rope crossings” over creek beds along the Jennings Hollow Trail. Some of the ropes needed tightening up, as all of the pulling and tugging that hikers had exerted on them over the years had left them a little bit slack. (This is where it helps if you can tie a trucker’s hitch.) And on the second such crossing, the rope led far away from where the trail picked back up, so most of us just picked our way over the rocks. By now, we’d come back around close to where we’d started. So there was a round of cheering and applause. And it was back up the rocky slope, and back over the gate and on to East Shore Road. Back at the parking area, Peter gave an explanation of how the trail maintainers’ logs were kept, and passed around a signup sheet for those of us interested in volunteering further. Now, about that sparkling apple cider? As promised, out came two bottles of Martinelli’s finest, kept on ice in a cooler during the day, and we all gathered around for a group toast. Not a bad day’s classwork! Good review, and a helpful reminder of ways to keep our trails clear. Hope we avoid extreme hurricanes this year. Steve (with the red rucksack). Hi, Steve! Yes, I never knew that there was a “right” way to prune tree branches – and yes, here’s hoping we don’t get any Sandy-sized storms. I am very glad to finally find your blog, as I had been looking for it since the training. I was at the training with you, and saw one of the pictures in Trail Walker. I was wondering if you would be so kind as to share the rest of the pictures? I did not take any pictures that day, and yours are awesome! Hi Erin! Thanks for your response! You can email me at nicole_rodriguez[at]bloomfield.edu. It would be awesome to see more of your pictures. Thanks a lot!